Why Do I Need an Electrician to Handle Electrical Panel Change Out? It might be tempting to save money by doing the job yourself, but only a licensed electrician should attempt an electrical panel change out. The panel is a critical part of your home’s electrical system, as it supplies the electricity that powers the entire structure. As such, changing one out is a very complicated process, one which should only be undertaken by a professional. Electrical work is always dangerous, and an electrical panel change out is even more so. In fact, in some cities, it is illegal for anyone other than a professional to attempt it. Immediate dangers like the risk of causing expensive setbacks or suffering from an electrical shock aren’t the only issues to keep in mind. If the job isn’t done correctly, your electrical system could be prone to failure, your devices could suffer damaged, and your home could be susceptible to electrical fires. Having a licensed electrician handle the job could help you stay clear of these hazards. How Do I Know I Need an Electrical Panel Change Out? Given all the responsibilities your electrical panel has, you should take care to keep it in good condition. As today’s technology continues improving, our power demands are rising as well, meaning your panel has to do more work than ever. If your electrical system isn’t capable of handling the demands on it or is becoming outdated, you’ll begin noticing signs that change is necessary. These can include constant circuit breaker trips, reduced outlet power, damaged appliances and frequent power outages. How Will an Electrician Ensure My Panel Change Out Goes Smoothly? If a licensed electrician completes the panel change out, you won’t need to worry about breakdowns and failures anymore. An electrician will ensure that every aspect of the new panel install meets electrical code requirements. The electrician will test your panel’s components using high-quality equipment to confirm correct setup. 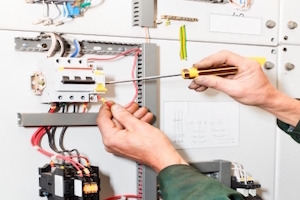 An electrical panel change out is an in-depth procedure, so an expert will take the necessary steps to ensure there are no errors, not even small ones. Even minuscule oversights could be a huge problem down the line, which is why hiring an experienced professional is critical. Who Can I Hire for My Electrical Panel Change Out Job? Wanting to save money is always understandable, but not when it comes at the cost of your safety. A qualified electrician can do the job effectively and safely. This investment lets you rest assured that your electrical issues won’t return. An electrical panel change out is a big job, so make sure you get the right assistance for it! Contact our expert electricians at Bryan Electric today at (770) 680-2144 if you have any questions about how we can help with your electrical panel change out.